The one thing we know about Samsung, is that they just love to flood the market with android phones. There are so many even I struggle to name them all! Samsung have obviously realised this and come up with a new naming scheme, that is designed to help you identify and classify the different phones they come out with. "S" (Super Smart) â€“ Devices at the very pinnacle of Samsung's mobile portfolio. This class will only be used on flagship devices such as the Samsung Galaxy S, the award-winning smartphone that has already sold 10 million units throughout the world. "R" (Royal / Refined) â€“ Premium category models, a combination of power, performance and productivity for the individual who wants to be defined by the technology they carry. "W" (Wonder) â€“ High quality, strategic models, perfect for those seeking a balance between style and performance. "M" (Magical) â€“High-performance models at an economic price-point. "Pro" â€“ This indicates that the device includes a QWERTY keyboard for speedier email typing and increased productivity for professionals. "Plus" â€“ This indicates that the device is an upgrade from an existing model. "LTE" â€“ This indicates that the device is designed to utilize LTE (Long-Term Evolution) connectivity standards, a 4G standard to provide increased mobile network capacity and speed. What are your thoughts on this? I think we had the general idea anyway, but it's nice to see this coming from Samsung officially. Samsung introduces new GALAXY smartphone naming strategy, expands GALAXY smartphone range SEOUL--(Korea Newswire) August 24, 2011 -- Samsung Electronics Co. Ltd., a leading mobile phone provider, today announced a new naming strategy for its GALAXY range of smartphones. The creation of the new naming system is marked by the release of four new GALAXY smartphone, the GALAXY W, GALAXY M Pro, GALAXY Y and GALAXY Y Pro, all of which run on the powerful Android 2.3 Gingerbread operating systems. Samsung has created a new and simplified system of naming its smartphones, focused on its ever-expanding portfolio of industry-leading Android devices. The naming structure will organize and group all devices into five classes, identified by a single alphabetical letter. Devices will then be further designated by an additional indicator which will identify specific functionality. "As Samsung continues to innovate, our goal is to provide consumers with an experience uniquely tailored to their needs. We have introduced steps to ensure users can simply identify the device designed to deliver the perfect experience for them," said JK Shin, President and Head of Samsung's Mobile Communications Business. "In addition to this new naming strategy at IFA this year we unveilling the GALAXY W, GALAXY M Pro, GALAXY Y and GALAXY Y Pro â€“ designed with the professional and social consumer in mind. These products further build on the phenomenal success we have enjoyed with the GALAXY range." New ways to identify your GALAXY Smartphones According to the new naming structure, new class designators refer to the specific category that the smartphone product fits into, for example a premium device, or an entry-level device. All classes will be used within the higher branding of the 'GALAXY' smartphones. - "S" (Super Smart) â€“ Devices at the very pinnacle of Samsung's mobile portfolio. This class will only be used on flagship devices such as the Samsung Galaxy S, the award-winning smartphone that has already sold 10 million units throughout the world. Â· "R" (Royal / Refined) â€“ Premium category models, a combination of power, performance and productivity for the individual who wants to be defined by the technology they carry. Â· "W" (Wonder) â€“ High quality, strategic models, perfect for those seeking a balance between style and performance. Â· "M" (Magical) â€“High-performance models at an economic price-point. Â· "Y" (Young) â€“ These are entry models or strategic models for emerging markets or a younger audience more sensitive to price. Class indicators allow a more specific description of the key selling points of a device: - "Pro" â€“ This indicates that the device includes a QWERTY keyboard for speedier email typing and increased productivity for professionals. - "Plus" â€“ This indicates that the device is an upgrade from an existing model. - "LTE" â€“ This indicates that the device is designed to utilize LTE (Long-Term Evolution) connectivity standards, a 4G standard to provide increased mobile network capacity and speed. Introducing the Samsung GALAXY W Equipped with high-spec technology including a 1.4GHz Processor, HSDPA 14.4 Mbps connectivity and a large 3.7" touch screen, the GALAXY W is the ideal solution for those who need to Live Fast and Live Smart. This powerful performance is enhanced with the inclusion of Samsung's Game, Social and Music Hubs, providing one-stop solutions for a consumer's gaming, socializing and listening needs. Kies Air enables additional control, allowing users who have misplaced their phone to track it, meaning complete peace of mind. GALAXY M Pro Providing a strong performance for high value, the GALAXY M Pro is the ideal solution for young and sociable professionals. A QWERTY keyboard provides swift, accurate typing on the go - enhancing productivity when drafting memos, documents and messages. The keyboard also simplifies communication with Social Hub allowing users to talk to whoever they want, however they want, all from their contact list. Communication history, instant messaging and updates from social networking sites are all readily available. An optical track pad and touch screen ensures the interface is easy and simple to use. This productivity and functionality is packed into a sleek 9.97m body. Designed with professionals in mind, the GALAXY M Pro offers extensive productivity through a variety of enterprise solutions, including Exchange Active Sync, Sybase Afaria, CISCO Mobile and CISCO WebEx. GALAXY Y Compact but with a full range of features and allowing the ability to stay social on-the-go, the GALAXY Y is an ideal device for younger consumers. Seamless multitasking is enabled thanks to the device's powerful 832MHz processor. The GALAXY Y includes Samsung's Social Hub, allowing users to stay connected with their online social circles. 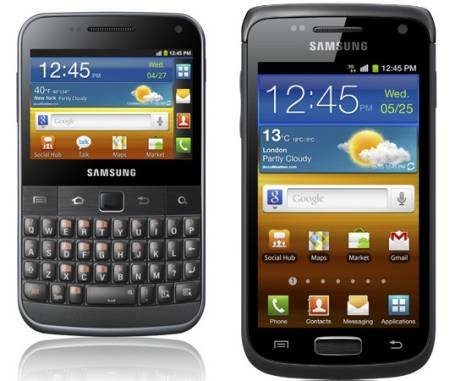 Equipped with Samsung's TouchWiz User Interface, the GALAXY Y delivers a simple and intuitive experience. Additionally, the inclusion of SWYPE facilitates speedy typing. The GALAXY Y is available in a variety of colors ensuring it can fit with anyone's style. GALAXY Y Pro Equipped with a QWERTY keyboard as well as enhanced social and professional features, the GALAXY Y Pro Smartphone is optimized for young professionals looking to manage both their work and home lives with ease. Users can stay constantly connected with Social Hub Premium, which supports email, social network integration and instant messaging. An optimized, intuitive touch screen interface allows an accessible and intelligent experience, while users are able to work on the go thanks to ThinkFree mobile office, enabling a variety of Office documents (Word, PPT, Excel and PDF) to be edited from the handset. Productivity is enhanced thanks to the combined power of touch screen and QWERTY keyboard inputs, enabling smooth navigation with efficient and professional input. WiFi Direct also allows faster transfer rates, allowing content to be shared quickly.